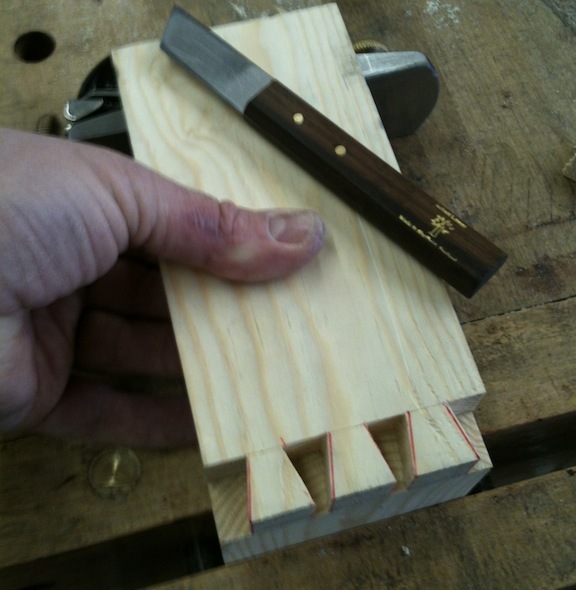 Dovetails – Actually Using Them! 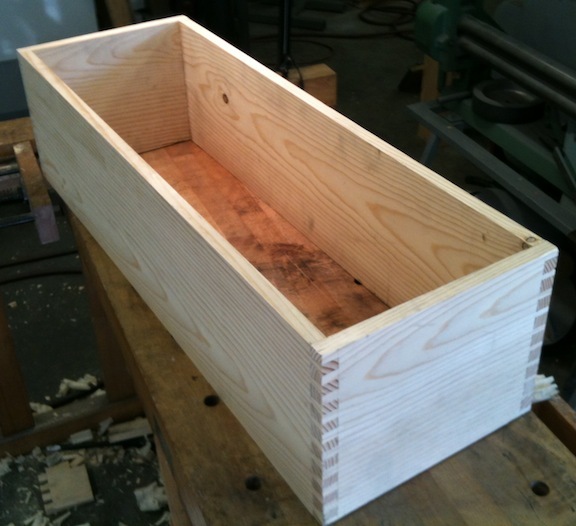 I started making a chest to keep my saws in, and it’s turned out to be great practice making dovetails. These are far from perfect, but three of the joints fit together with almost no paring to get the fit nice. The fourth, well apparently it shifted slightly when I was marking out the pins and I ended up having to pare away one side of half the pins, leaving a small gap on the other side. Rats. Three of the sides look like this. A spot or two where the fit could be better. The spacing is uneven because my layout and sawing needs more practice. Here is the carcase, glued and planed on the outside. After I put on the skirt and paint it I think it will look really nice. I’m off to Home Despot to get some stock for the skirt and bottom boards. I’ve been practicing my sawing, and I’m (finally) getting more comfortable with keeping the cut square to the face of the board on the tails, which is encouraging. As you can imagine, it’s just practice. Since I had used up the last of my cheesy pine scraps on practicing sawing, I picked up two 1 x 10 pine boards at the big box store with the intention of making a small chest to store my saws in. This has been great dovetail practice, and I’m confident enough of my “prowess” that I’m certain I can make “paint grade dovetails” now. (read: they will at least fit together). So I marked out and sawed the tails, and now I’m ready to chop out the waste between the tails, and saw out the half-pins on the ends of the tail boards. Let’s look at that first. I made sure to get a nice deep cut with my marking gauge when marking out the baselines. The reason is that I wanted to make sure I had a clear, stable shoulder to use to pare to after clearing the bulk of the waste. When I sawed the half pin area I had the board turned so that the tails were to my left and tried to leave half of the baseline mark. 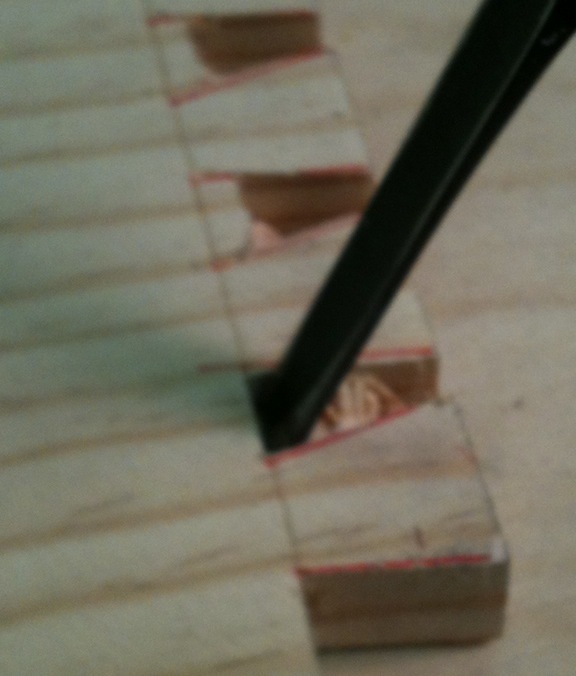 Using this shoulder as a guide I can pare away the waste with a sharp chisel. Tim recommended using a sideways slicing cut when doing this, and it really helps with controlling the cut. I tried to be super careful about staying above the baseline because a gap here will be really obvious. I think I did OK, the proof will be seeing how all the joints fit together. Next it was time to deal with the waste between the tails. I’ve been using a coping saw to remove the waste, but I’m not satisfied with the results. The saw blade on my coping saw is slightly larger than the kerf left by my Lie-Nielsen saw, so I have to start a new kerf for the coping saw or risk gouging the sides of my tails. I read in Christopher Schwarz’ blog about taking some of the set out of a coping saw blade, which seemed like a good idea. I used a coarse stone to dress both sides of the blade. I’d used this same approach to get my first dovetail saw to cut straight, so I had high hopes this would be a slam dunk. In the end it turned out to be a mixed bag. The saw drops right into the kerf now, but removing some of the set really affected the blade’s ability to turn a sharp corner. Before, I could make a really sharp turn with the blade. After, the blade could only turn perhaps a 1/4″ radius at best. That meant the I still had to start my turn up high in the kerf, and still had to make two cuts per tail. Maybe I should have taken less set off of the blade? 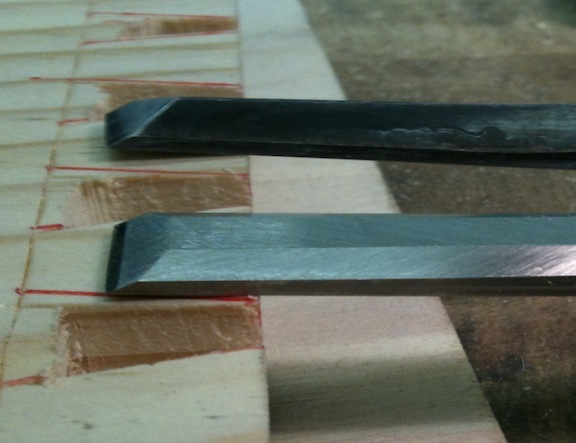 I’ll experiment more, but I’ve also ordered some coarse blades for my fret saw to see how that works for me. Rob Cosman recommends that approach, and it’s hard to argue with his results. Since the saw was now difficult to turn I ended up having to stay pretty far above the baselines when sawing out the waste. It’s a little more chopping, but not a huge deal. Before chopping out the waste, take a close look at your chisels. I’m using a set of Sandvik chisels that I’ve had for years — although in my power tool days they were just a shop decoration. They are comfortable to use, easy to sharpen and seem to hold an edge well. But they are lousy for dovetailing. Why? Look at the side view. That big vertical shoulder digs into the side of the tail and leaves a gouge that is visible in the finished joint. The chisel in the back is a Japanese dovetail chisel that has the edges beveled. It’s the only one I have, but I like the way it works. I may re-grind the sides of my Sandvik chisels, although I’m fairly tempted by the new Stanley chisels. Here is how I’ve been approaching chopping the waste. 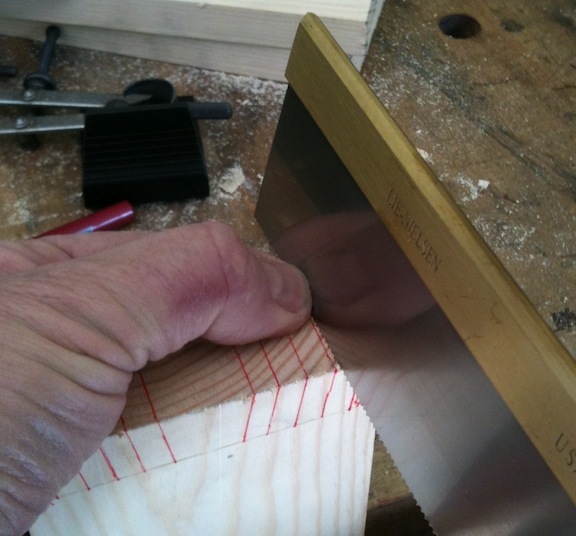 I chop the waste to within 1/16″ of the baseline at the most. 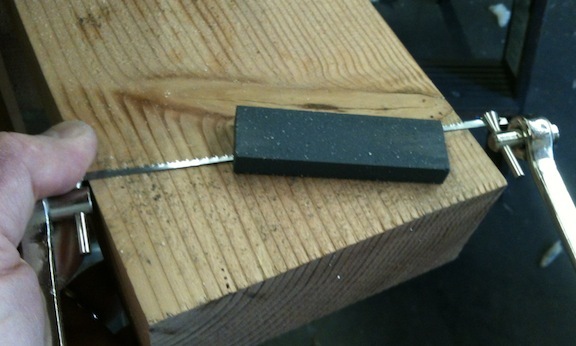 I try to split the remaining waste with each placement of the chisel, taking a maximum bite of perhaps 3/16″. The rationale for removing the waste as close to the baseline as possible is that the waste will push the chisel back past the baseline. 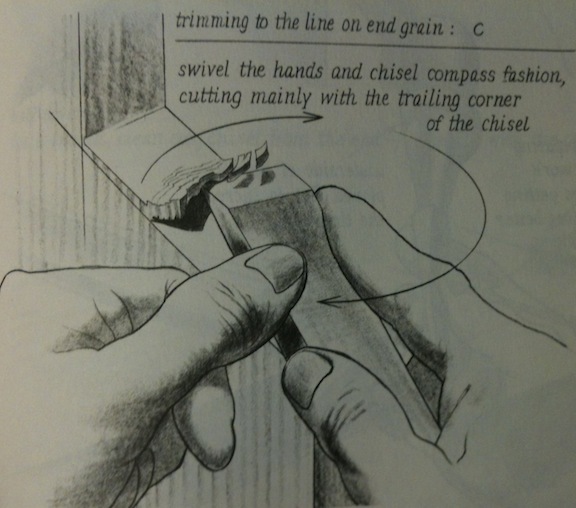 The chisel is a wedge, and Pine is really soft. It doesn’t take much to dent it. If you try to take too bik a bite when clearing the waste you run the risk of jamming it against the sides of the tail – which in this Big Box Pine (Squishius Cardboardius) will certainly damage the joint. I also only go half way through the wood, chopping from both sides. Take moderate bites. I try to take half of the remaining waste with each roughing cut. If the space is particularly narrow or there is an excessive amount of waste I take a bit less to avoid jamming the waste against the shoulder of the tail. I get a close to the baseline as I can before dropping my chisel into the baseline and chopping out the last bit of waste. And be careful not to pry against the shoulder. 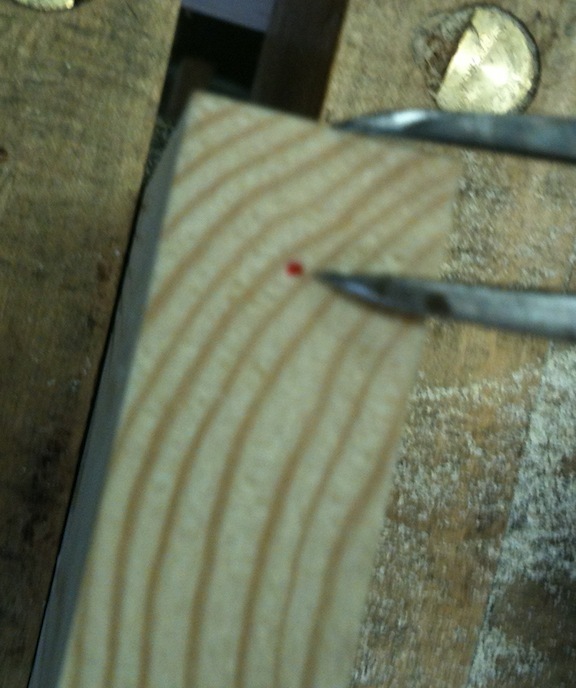 After chopping I carefully pare the bottom of the joint looking for any high spots. There is always some crumbs in the corners that needs to be removed. I don’t have a good picture of this, but what I do is to choke up on the chisel so that when I’m paring between the tails so that if it slips it can only go half way through the joint. After cutting the tails on both boards for my saw chest I’m feeling more comfortable with the whole process. 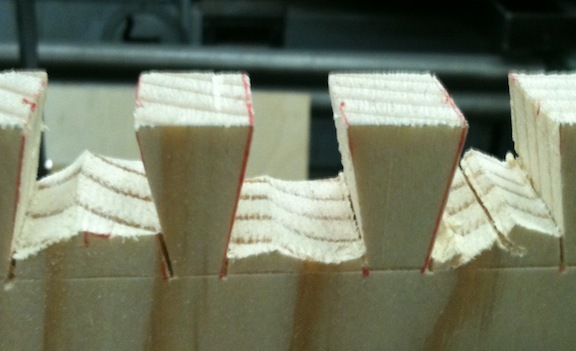 Cutting practice joints is all well and good, but cutting joints on an actual project feels great. Next, I’m onto the pins for the chest. 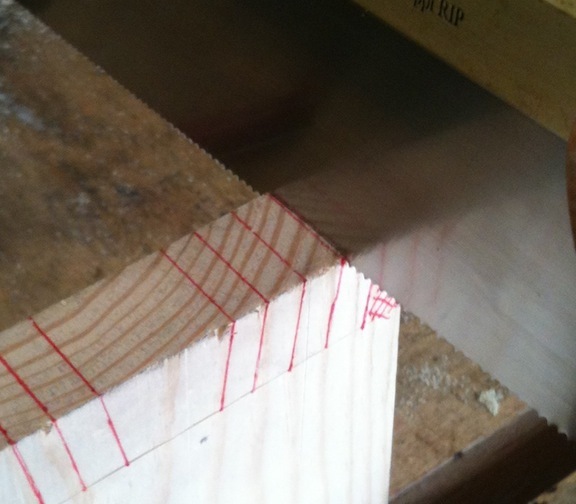 Laying out dovetails is probably the simplest part, but there are a few tricks that help. I’m doing tails first. Apparently there are two camps, the pins-first folks and the tails-first folks. 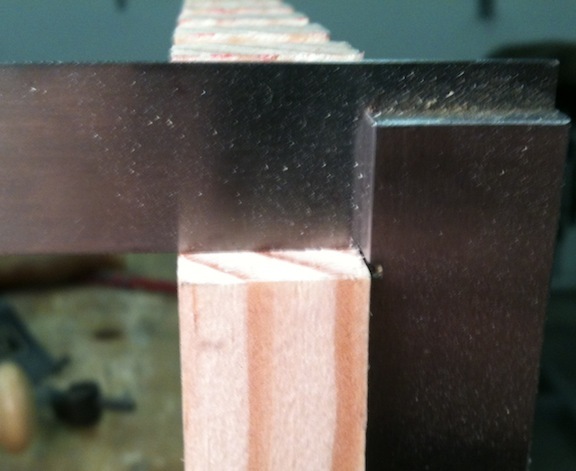 I’m just trying to get a handle on dovetailing, and this is what is (sorta) working for me. To do the layout you will need a red pen, sliding bevel gauge, a marking gauge and two sets of dividers. 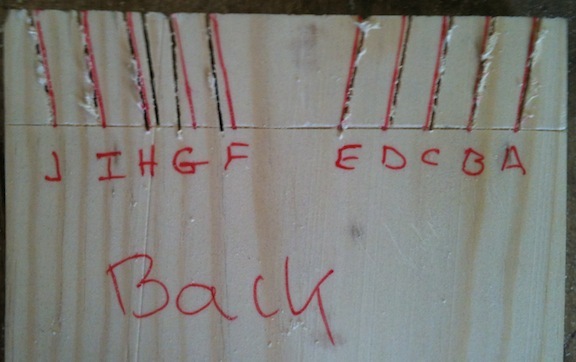 Start by scribing a line across all four faces using the marking gauge set to the thickness of the wood. This is your baseline, don’t cut or chisel below it. I really like the crisp line the Glen-Drake gauge makes, but the brass leaves a black smudge on the pine and I’m not sure why. I cleaned it with solvent top make sure there wasn’t any leftover polishing compound on it. Maybe I’m pressing too hard against the end grain? We’ll use one of the dividers to mark the half-pins at each end, and the other to mark off the spacing. Jim and Tim recommended using half the thickness of the board as the width of the half-pin on the ends, so I’m going with that for now. Set one divider to about half the thickness of the stock, and make a mark that distance in from the front and back of the board. If you guessed half the thickness exactly there will only be one mark, otherwise adjust the dividers to split the difference. Now make a mark that distance in from each edge and set those dividers aside. We’re using two dividers because in the real world we would be making several identical joints, like the four corners of a drawer, and we want to have them match. Now we need to mark out the spacing for the dovetails. You could measure the distance, divide by the number of tails and measure the difference off using a set of calipers. Or you could use the other pair of dividers to simply step the distance off. I’d recommend the later. When I first read about this approach I had to read the description a few times, then try it myself. Essentially what we’re going to do is set the dividers by eye, step off the distance and adjust them calipers. Once we’re satisfied we’ll step off the distance, starting at the left half-pin mark and moving to the right and making a small mark each time. Then start at the right half-pin mark and step off the distance to the left, again making a mark. How wide do you set the dividers? If you want 3 tails set them to about 1/3 third the distance. Make a practice run, stepping off the distance but not making any marks. When you get to the other end look at the amount that you’re overshooting the other half pin mark. That overshoot is going to be the size of the space between the ends of the tails. I usually have that set at about 3/16 of an inch. In other words, the space between the tips of the second set of dividers is set to the width of one tail plus the width of one pin. If you’re happy with the size of the pin, go ahead and step off the distance from each half-pin mark to the other side, making a mark at each point. This method is very fast, and foolproof (I can do it!). 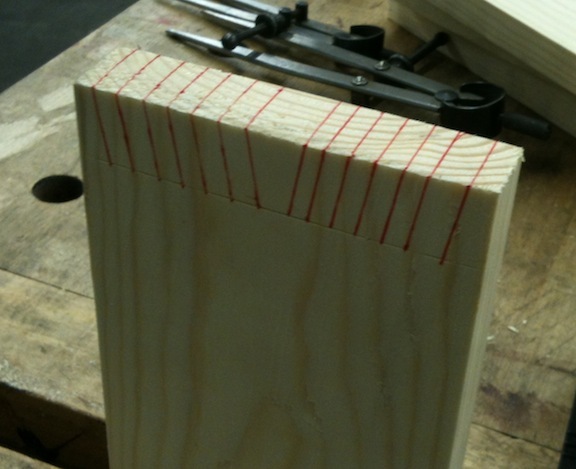 Next, draw a straight line across the endgrain with a square. 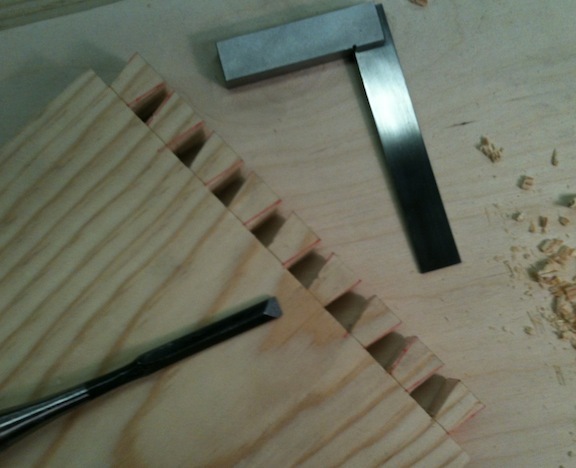 Now set you sliding bevel for whatever slope you’re using for your dovetails. 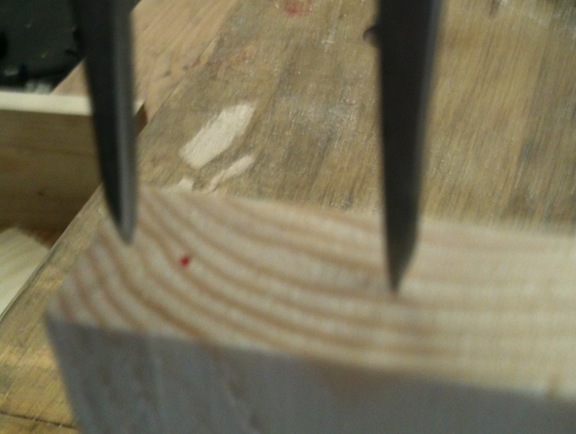 This setting, like pins-first vs. tails-first, is one of the things woodworkers like to have debates about. Typically the angle is specified as a ratio or slope like 1:6 or 1:8. This just means that for one inch in width the angle meets at 6 (or 8) inches up. 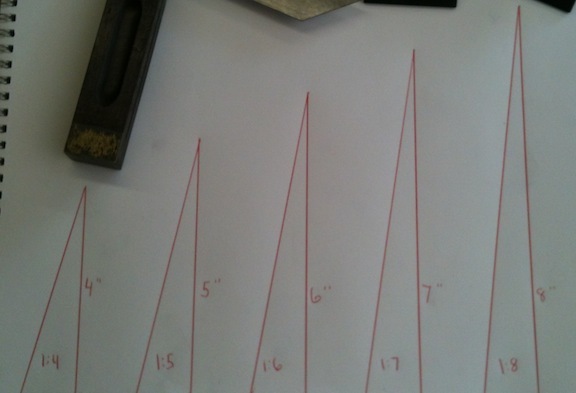 You can easily draw out a series of these angles and use it to set your sliding bevel gauge. For what it’s worth, if you want to know the degrees measurement you can take the arc tangent of the height number times 10. For example, a 1:8 ratio is arctan(8) * 10, or 14.4644133 degrees. Ratios are easier. 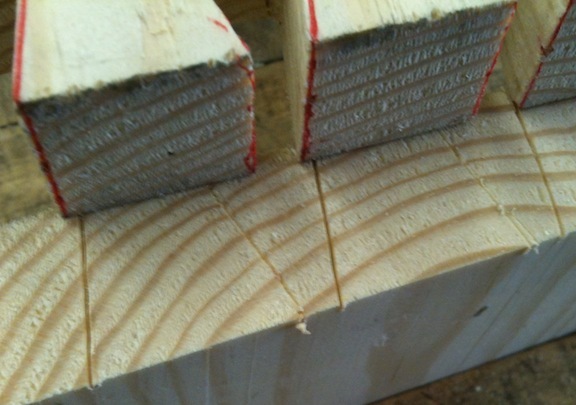 The only reason I know this is that Lee Valley sells these groovy dovetail saddle squares that you can use to mark both the straight line across the endgrain and the angled line on the face in one shot. They sell them in 1:6, 1:8 and 14 degrees. Why? Turns out 14 degrees is a 1:7.24460662 (call it 1:7.25) slope. Still, it’s odd. Here are my 1:6 an 1:8 Lee Valley gauges. I have no idea where my 14 degree gauge is, off on a weekend rendezvous with my metric hammer probably. I used my sliding bevel gauge to lay these out at a 1:5 slope. Or 13.7340077 degrees…oh, never mind. Finally, mark the waste. It’s too easy to cut in the wrong place. Or plane your thumb, but that’s another story. At this point you’re ready to cut the tails. We talked about sawing yesterday, so let’s skip that (and chopping/paring) and mark out our pins next. This is easy. 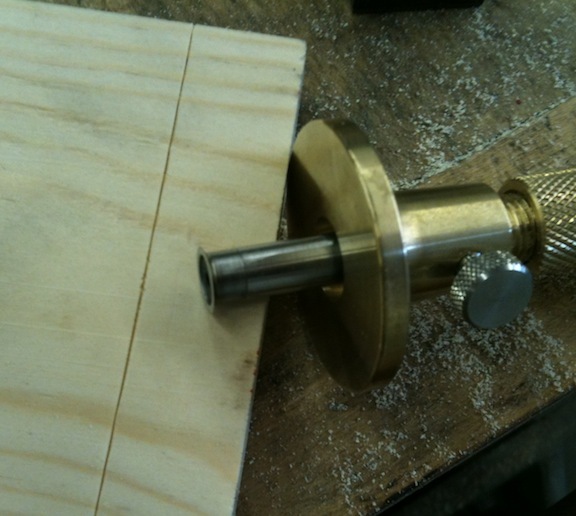 Clamp the pin board in your vise with it level with a plane or other spacer, then set the tail board on top. Line up the two sides, and align the baseline on the tail board with the inside face on the pin board. If you marked the baselines exactly the width of the stock you can just align the ends of the tails with the face of the pin board. Make really light cuts at first so that your knife doesn’t follow the grain, but follows the tail. 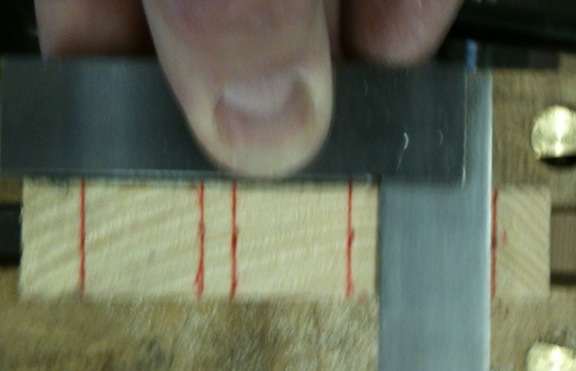 In case you’re wondering, I HATE that marking knife for laying out dovetails. I’m going to buy or make a spear-point marking knife. The problem is that on the left side of the tails the bevel of the blade is in the wrong place and it leaves the mark in the wrong spot. Finally, use your pen and square to draw in vertical guidelines from the knife cuts down to the baseline. Thats about it. Marking the tails is pretty failure proof. Marking the pins from the tails is a little dicy because if you don’t have the two parts perfectly aligned they won’t fit properly in the end. There is a trick to help this, which I’ll experiment with and cover in the future. The idea is to cut a shallow rabbit on the inside of the tail board, right at the baseline, before laying out the tails. This gives you a shoulder to align the two parts. 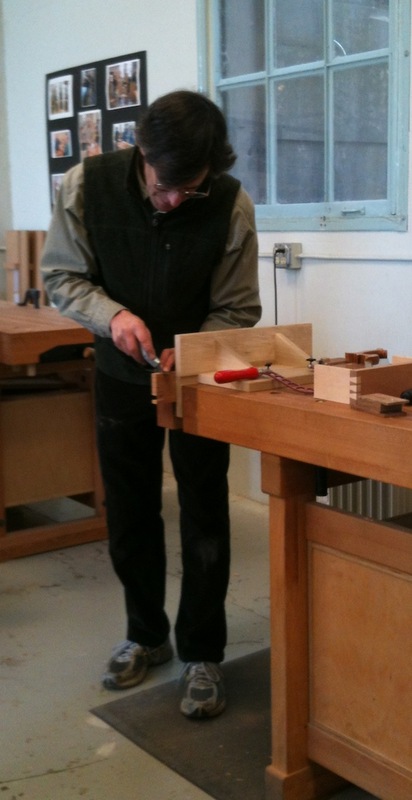 Two weeks ago I attended a Hand Cut Dovetails class at the Port Townsend School of Woodworking. I’ve wanted to write about what I learned ever since, but life has conspired to delay that. A visit from my parents, my son’s chorus concert at school (he was very cute) and a dozen other things — all good, but time consuming. When I was doing power tool woodworking years ago I couldn’t imagine doing dovetails by hand. I had a router table with a fancy-schmancy Jointech fence and template system. I could make all kinds of fancy dovetails with that, but with a saw and chisel? Uhmm, not so much. The idea of hand made dovetails seemed unobtainable, as if it were reserved for master craftsmen. So learning how to do this has been something of a focus for me. As much as an adult with ADHD can focus on anything anyway. One of the things I came away from Port Townsend with is that there are basically four things you need to know how to do to cut dovetails. Maybe five if you count stock preparation, but let’s gloss over that for the moment and just say that it’s a given. 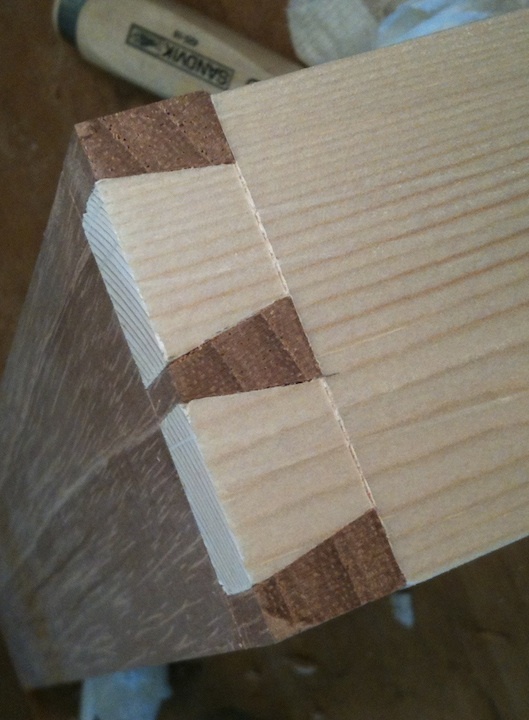 There are a number of steps, a cookbook-able process to follow for any style of dovetail joint, and if you can perform these four basic skills you can cut a dovetail joint that will fit. If you can do them with a high degree of accuracy, consistently, then you can be like Rob Cosman and glue them up right from the saw without test fitting. Note that I have no illusions about being Rob Cosman (or John Malkovich), I’m totally a beginner and am just sharing what I’ve learned. Of these four procedures, sawing was the one that caused me the most trouble, and if you can’t do that accurately then you’re going to be frustrated. I know, ask me. I could generally have the cut square across the end of the board, and follow the line down the front face, but the cut on the back would consistently be off. The instructor, Tim Lawson, even had Jim Tolpin test my saw to make sure it wasn’t bewitched. It wasn’t of course, I’d already anointed it with chicken blood and performed several ritualistic chants. I just needed some critique on my technique and some practice. So let’s start with what I learned about sawing accurately, then we can move on to the other basic dovetail skills in future posts and hopefully put it all together at the end. You’ll need a decent dovetail saw. I got a Lie Nielsen dovetail saw for Christmas this year, to replace my cheap gents saw. You can get a cheap saw and tune it up, but if you don’t know what you’re doing why start with an unknown? The LN isn’t cheap at $125, but it’s a solid piece and has a good reputation. It’s beautiful tool too. At the school they had the Veritas dovetails saw. It worked well too, and it’s half the price (literally) of the LN. I don’t care for the looks personally, but I’ve got an aesthetic hang up when it comes to tools. The over-moulded back just doesn’t work visually, but as I said it cuts just fine. In case you haven’t noticed, I tend to get caught up in tools. I’m sure I’m the only one that does that, so it’s OK. 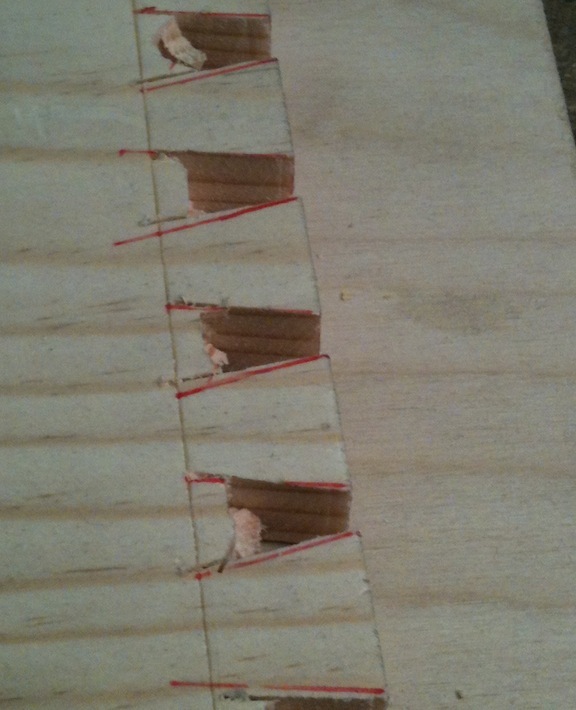 Here is the sawing process that Tim coached me through to resolve the Crooked Cuts(TM). First, we need something to practice with. I’ve been using some squishy White Pine from the local big box store. I pick through the stock and find the straightest pieces. Cut them to length and shoot the ends square. Don’t leave your left thumb sticking out when you’re shooting the ends with your right hand. I’ve already learned that lesson, no point in you having to repeat it. I’m not sure this is the best material for learning dovetails – it is so soft that the chisel work requires uber sharpness and a careful touch. But it’s readily available and more-or-less ready to go from the store. 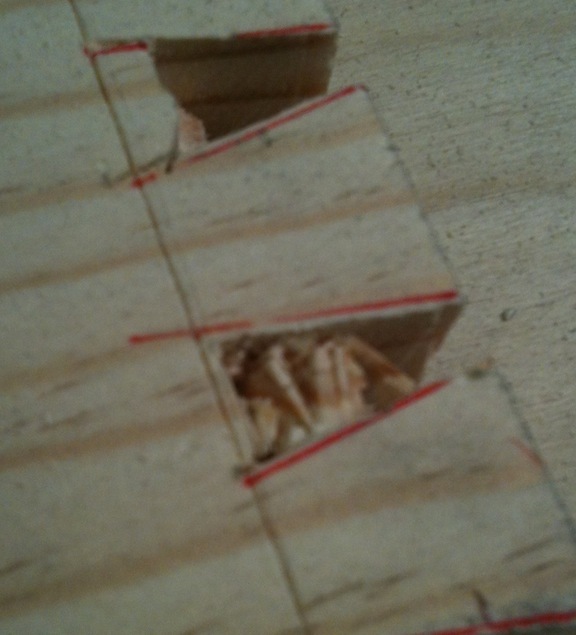 Starting with the tail cuts, it’s critical that the cuts be square to the face of the board. If the cuts aren’t square you’ll spend a ton of time paring them to get them square. 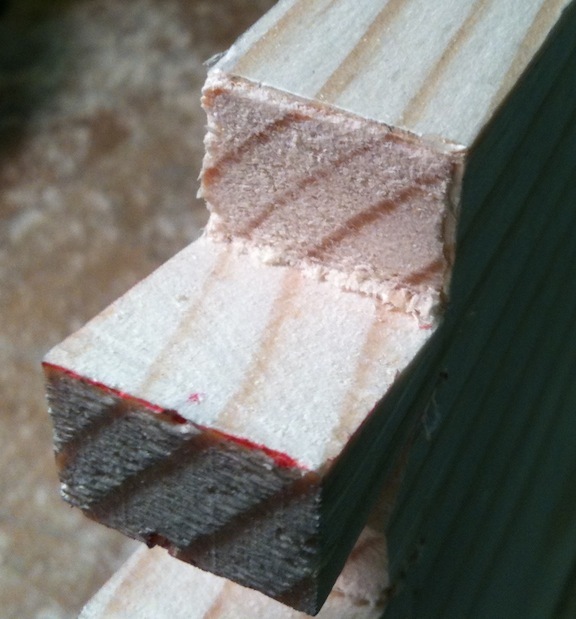 At best it will waste time, more likely it will be a joint that won’t fit well or will look uneven. Or both. Likewise, the pin cuts must be absolutely plumb. If the sawing isn’t accurate you’re starting out with a big disadvantage. Spending time practicing accurate sawing before attempting to make a dovetail joint will save you a lot of frustration. Mark a series of practice cut lines on the end of a board. I’ve scribed a shoulder around the part so that I have a target to stop at. These are a 1:6 ratio, but really any angle is OK as long as it’s the same for all cuts. We will look at layout later, right now we just need a consistent set of lines so we can practice making consistent cuts. Spacing doesn’t make any difference at this point. I’m going to deviate slightly from what Tim recommended. His advice was to orient the board so that the cuts are plumb – in other words the board would be tilted to the left for the first set of cuts and to the right for the second set of cuts. Try it and see if it helps. The idea is that then you just need to learn to saw plumb, and the weight of the saw helps with that. I want to be able to cut without having to re-orient the board, so that’s what I’m practicing. 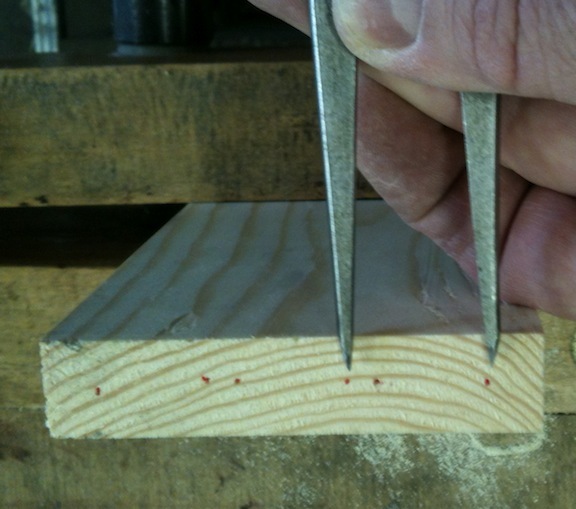 First, use the thumb and index finger to pinch the board next to the cut line. We’re going to use these two fingers as a guide to keep the saw in place as we start the kerf. It also helps stabilize the board, and ties your body, the board and the saw into one connected unit. Hold the saw gently with a three finger grip, your index finger pointing down the length of the blade. This was described as “imagine you’re holding a baby’s hand”. I’d add, it’s not a newborn, but a baby that is just starting to walk and needs something to hold on to. Your hand is relaxed, but not limp. 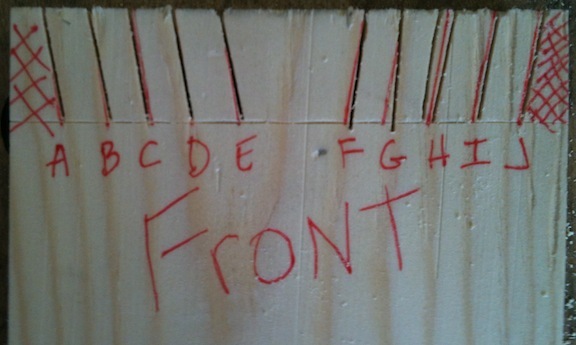 Stand in front of the board, to the side of the cut so that your saw arm is in a straight line with the layout line. Your wrist is locked and your arm is going to move forward and backward like a piston in an engine. You also want to lift up on the saw so that perhaps only 20% of it’s weight is on the teeth. I imagine I’m tickling the end grain. Now gently press the saw against the thumb and forefinger of your off hand. Squeeze your guide fingers to push the blade into position. The blade should be on the waste side of the line, and your eyes should be on the opposite side of the line. Looking on the non-waste side, you should see the entire line with the blade parallel to it. You want to make your cut exactly next to the pen line. If you try to cut on the line it won’t be as accurate. Begin sawing at one corner, either the front or the back. Try both and see what works best for you. Let’s assume you’re starting at the back corner. As soon as the saw begins a kerf at the corner you want to begin lowering the handle, watching the layout line on the end grain, walking the kerf square across the board. As soon as you have a tiny kerf started, stop. 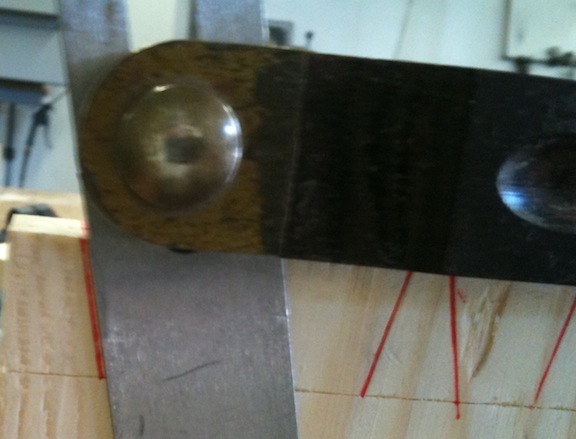 Sight down the sawplate and make sure your aligned with the angled line on the face of the board. Take another few strokes, just enough to bury the teeth. 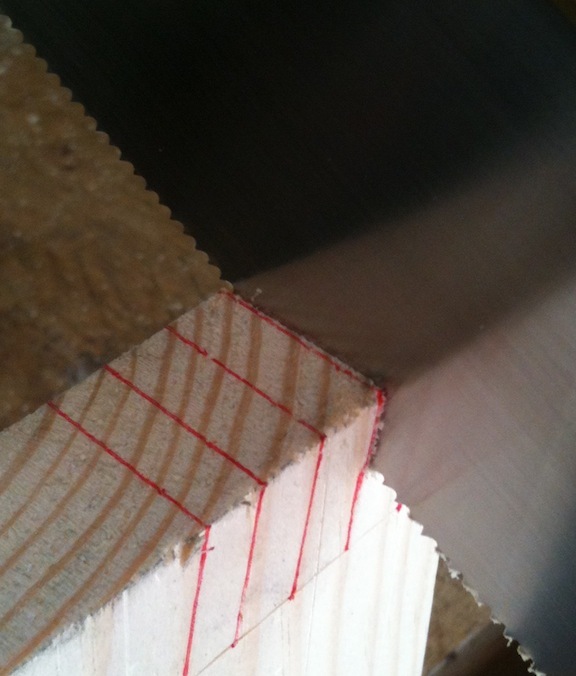 At this point your kerf is perhaps 1/16″ deep or slightly more. 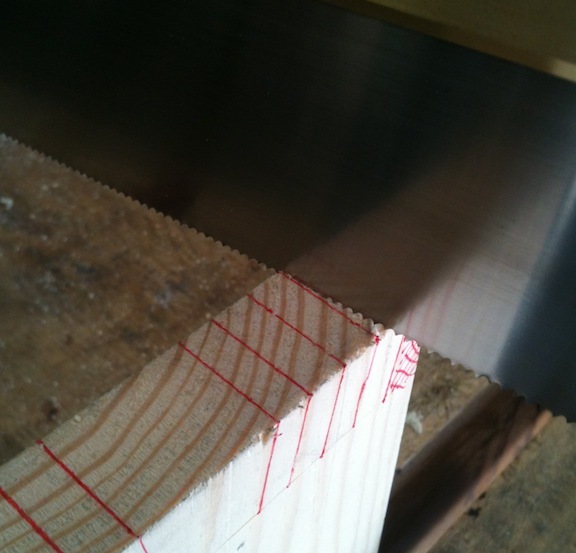 Notice that you can see the reflection of the end of the board in the saw plate. If the reflection is lined up straight with the end of the board you’re square. Now continue sawing, pivoting the blade around the back corner, and walking the kerf down the front face. Don’t let the saw come out of the kerf at the back, but also don’t saw any deeper there. Stop at the baseline, or just a hair above. When you reach the scribed baseline pivot the saw around the front corner of the cut, bringing it down level. 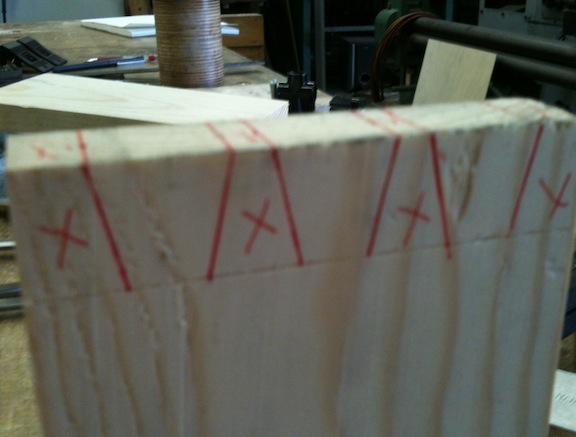 This uses the kerf you’ve accurately established to guide the cut on the back. Make sure you’ve reached the baseline on the front and the blade is horizontal. If you always saw from the face side or outside of the part then any tiny overshoot of the baseline on the back won’t show. It’s actually not that hard to hit the baseline, getting the cut square and on the correct angle is the magic. As it turns out, for the tails, if the angle is off it doesn’t matter – as long as the cut is square to the face of the board. 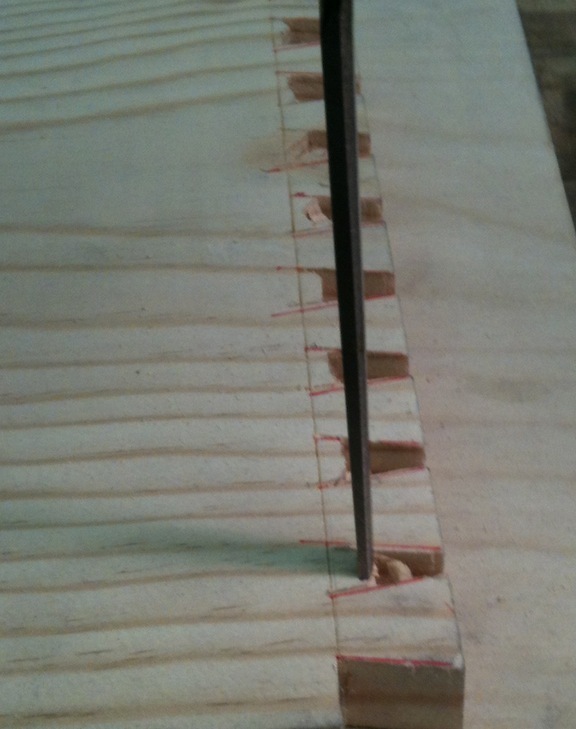 That is because when we get to actually making a joint we will use the tails to layout the pin cuts. 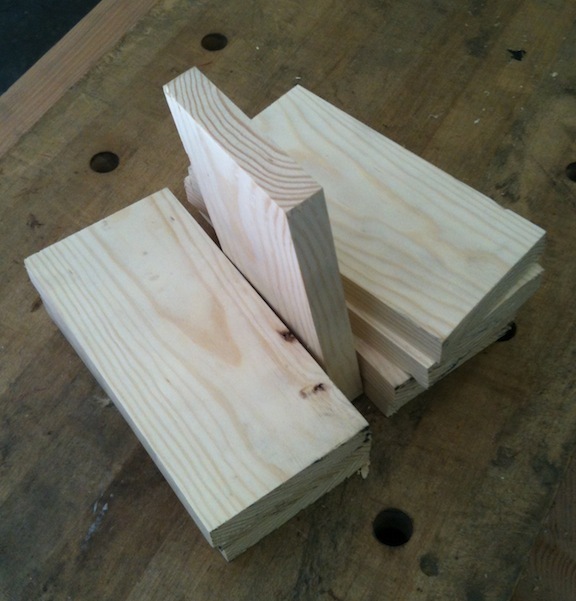 For now, just mark and cut a few practice boards to get into the rhythm of sawing and practice getting it straight. Here is the front of one of the practice boards from my 11 year old son. H, I and J look pretty good on the front. Ignore the H cut that is to the left of the line, that’s just miserable. Ditto on A, C and D. F and G fail because the go below the baseline. A, B, C, H, I, J all look pretty good from the back too. But check out F for example. It looks good on the front and top (other than sneaking past the baseline) but it drifts waaaay off on the back. Using the technique that Tim recommended helps with this, K0lya was mostly just charging straight down – the ones where he worked down the front first came out better. I’m going to go make some more practice cuts, then we’ll take a look at layout, chopping and paring. 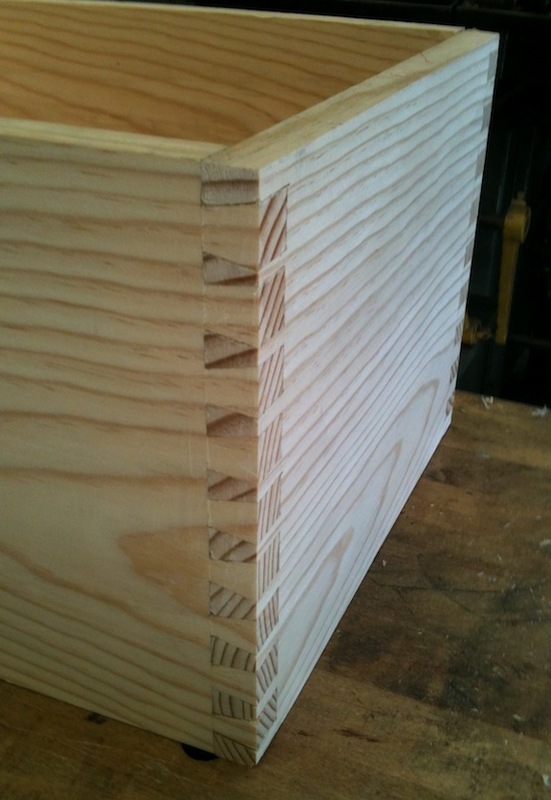 I’d love to hear how you do dovetails, as I said I’m just learning and this is what is working for me at the moment. I spent the weekend in Port Townsend for a dovetail class. It was a lot of fun, and really helpful to have someone look over my shoulder and point out what I’m doing wrong. Jim Tolpin taught the first morning, and Tim Lawson taught the rest of the weekend. The school is well equipped with hand tools and nice solid workbenches. And the weather was beautiful. The best thing about the class was having Tim watch what I was doing and make suggestions on what I was doing wrong, that was a huge help. Tim covered through dovetails and half-blind dovetails, and we had a lot of time to practice. I’d have preferred a little less time practicing and a little more instruction. I’d have liked to see full blind dovetails, houndstooth, and other variations demonstrated. I plan to post some step-by-step instructions later based on what I learned, but I’ll just leave you with one tidbit of wisdom for now: Don’t let your thumb stick out when holding a short piece of wood on a shooting board. Ask me how I know.